Looking for an upgrade from a hatchback? The best options now are the Ertiga or the Dzire. Both possess the same DNA since they are based on the Swift platform. But still one is better than the other. We tell you which. The new Dzire, after going under the sub-four metre knife, looks better than its predecessor. The stubby rear now gives it a more proportional look. The Ertiga looks and feels more premium, especially from outside, and has this very European sense of design which is more noticeable and likeable than Dzire. The interiors are the same, even the width is the same but you get a more spacious sense in the Ertiga because its taller design means more head room. Both have 1.3-litre engines under their hood in different tunes. The one in the Dzire produces 75PS of power and 190Nm of torque while in the Ertiga it produces 90PS of power and 200Nm of torque. The Ertiga not only produces more torque but also does it earlier than the Dzire giving it more pulling power. The overall fuel efficiency is 17.64kmpl for the Dzire and 15.21kmpl for the Ertiga. The Ertiga engine is equipped with a VGT making the power delivery more linear than the Dzire. When you get behind the wheel of the Ertiga, the vision from the higher up seating is more commanding which enhances driveability in the city since you have a much larger view. 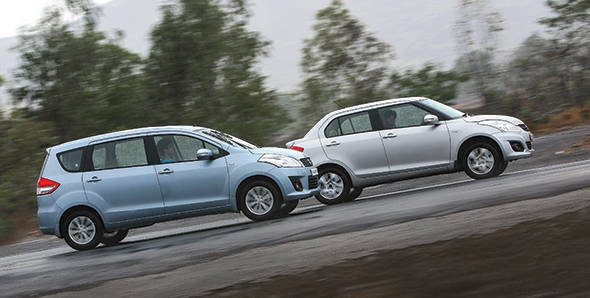 In terms of handling, in spite of its bigger size, the Ertiga is on par with the Dzire. The heavy steering on the Maruti gives you slightly more confidence around corners. There is slightly more body roll as compared to the Dzire though. The soft suspension setup means the ride quality on the Ertiga is supple which tackles undulated roads better. The NVH levels in the Dzire cabin are better with the Ertiga suffering from wind noise at highway speeds. The Dzire does have more engine noise though. If we compare the top-end diesel models the difference is one lakh. So the question is whether you would pay that much more for an extra row of seats. This jump from a hatchback to something bigger is governed either by an increase in family size or increase in mass of ego. The Ertiga will appeal to the first case. It will comfortably seat four adults and two kids while the Dzire is restricted to four. The extra luggage or the 'extra' kids can all fit in the third row. It's the practical solution and provides you with all the benefits of an MUV while having car-like character. And the Ertiga will also appeal to the second case. You see the Dzire is not something that stands out but the Ertiga has the classy look to match the status seekers. The Ertiga breaks away from the MUV look and feel and this will appeal to the younger lot too. The Ertiga emerges the better choice here and it will definitely eat into the sales of the Dzire. We are family people after all.